If the Java applet fails to start due to Java Security issues, click here. 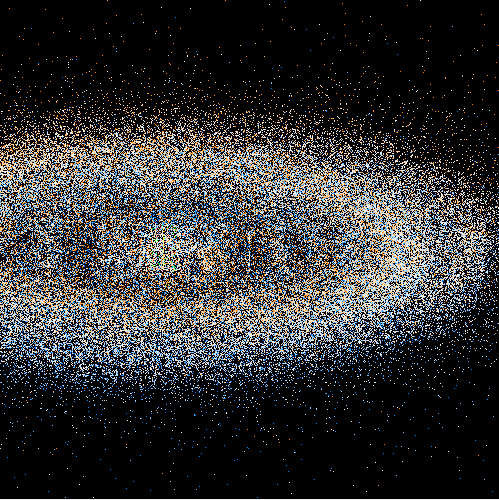 The applet below simulates the fourteen main bodies of our Solar System and about 2000 massless test particles (referred to as asteroids below). 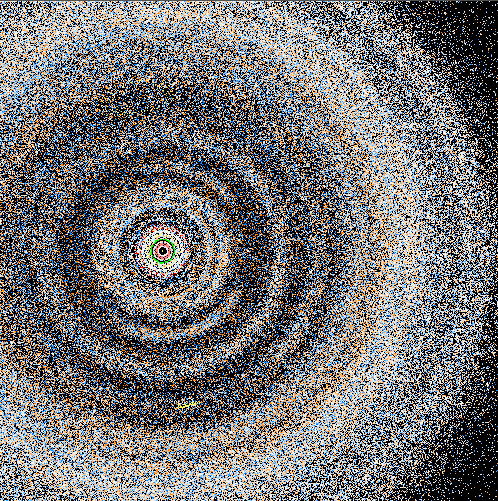 The Solar System bodies are given initial positions and velocities from JPL's Horizons Ephemerides. The test particles are initialized with circular orbits about the center of mass. Jupiter and the other Solar System bodies quickly perturb many of them. The test particles have random inclinations relative to Earth's orbital plane. The inclination is uniformly distributed between zero and 5 degrees. Also the orientation of the tilt is random. Since out-of-planeness is hard to depict, test particles "above" the plane are colored orange/red whereas particles "below" the plane are colored cyan/blue. Particles in the Earth's orbital plane are shown white. The Sun, planets, moons, TNOs, and comets are given fixed colors independent of location. Click the "Start" button to run the applet. Parameter "dt" controls the step size (in years). The "warp" parameter controls how many iterations of the integrator are performed between updates to the display (a larger value allows the simulation to run faster without sacrificing precision). Parameter "center on" selects a body to hold fixed in the center of the window (Jupiter is body 5). The simulation space is counter-rotated to hold the Sun fixed on the negative x-axis. Here's the applet. For some snapshots, see below. Letting the simulation run for 30,000 years and then plotting positions every 10 years over a few hundred years, we see that most (all?) of the test particles that started out on an orbit just inside Jupiter's orbit have been widely scattered but that the so-called trojan asteroids remain roughly in place as does a bright inner asteroid belt and faint outer one. Jupiter is dead-center and the Sun is held at a fixed location to the left of center in all of these snapshots (in other words, the individual snapshots are scaled to keep the Sun-Jupiter separation fixed, i.e., Jupiter's eccentricity is factored out of the display (but not the dynamics). The small green circle is Venus' orbit. The red circle inside that is Mercury's orbit---it is eccentric and therefore appears thickened.